The State of Florida requires home sellers' to disclose all known defects that might materially impact the value of a home, yet there seems to be an area where most sellers (and their listing agents) appear to "forget" to be totally forthright. When a real estate company is hired for the job of selling a home, the listing agent typically has the homeowner fill-out and sign a Seller's Property Disclosure (SPD) form. The seller is supposed to record all changes that have been made to the property and itemize things that might be wrong with it too. For the most part, I think home sellers try to be honest on this, though many are concerned about this process working against them gaining top dollar when they finally do sell the home. Usually, with proper explanation, they do the right thing. But there is one big exception to this rule. This is one of those articles that might sound very much like common sense, but I can assure you that this is not the case. And the purpose of this article is not to provide advice for buyers about the seller's property disclosure, rather the intent is to educate people who are selling a home in Tallahassee about their disclosure responsibilities in order to prevent unnecessary legal actions after the sale of a home. The key is to disclose, disclose, disclose. If you are not sure if something (that you know) might impact the value of the home, go ahead and disclose. My experience has shown that most things put in the disclosure "up front" do not stop a home from selling, it is the discovery of those same things with no disclosure, after contract, that creates all the messes for home sellers. Specifically, if your roof leaked and you fixed it (or had it fixed), disclose it. If your yard floods during heavy rain storms, disclose it. If you had a pipes replaced or inspected, disclose it. When in doubt, disclose it. If you will live by this as a rule, you should have no problems when you sell a home. OK, so when do we typically see home seller's fail to disclose? After doing repairs or replacements for a buyer, the seller should update the Seller's Property Disclosure and provide a newly dated version to the buyer at closing. This protects the seller from the buyer saying they were not told of something. But equally as important, if the sale does not close (which happens often), the updated disclosure form should be the one offered to new buyer prospects. And this is the area I see seller's most-often mess up. They provide the new buyer prospects with the original, out-dated SPD even though they know they performed work for the previous buyer. Do not let this happen to you! If you are planning a home sale in the near future and would like some pre-advice before you put the home on the market, we offer an excellent, no-strings-attached home visitation evaluation. We'll look at your home's condition, recommend some "elbow grease" preparations, and give you a firm idea of what your home would sell for in today's housing market. To get started scheduling this, just drop me a note and we'll be in touch shortly. 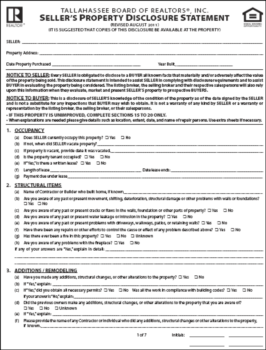 What Is A Disclosure Statement When You Write A Real Estate Contract?